Zaffia Laplante and Faiq Ahmed have a knack for creating innovative solutions. The two Wilfrid Laurier University students, along with University of Waterloo (UWaterloo) student teammates Emily Hem, Alex Haik and Carla Carolina Perez, were recognized at StarterHacks in the Best Internet of Things (IoT) Hack category for a prototype that could improve public transit experiences for riders with auditory and visual impairments. While the exact details of the project are still confidential, the prototype employs a tactical interface that will prompt riders to read current and upcoming transit stops. It also leverages innovative sensory applications that enable users to request their stop. The introductory hackathon offers newbies like Laplante and Ahmed the opportunity to learn, collaborate and create while improving their coding and computer programming skills. On-site workshops and mentors from local technology firms and educational institutions provide hands-on learning and one-on-one support. The team received a DragonBoard 410c – a leading development board with advanced processing capabilities – as their prize at the 24-hour event held March 3-4 at the University of Waterloo. More than 600 students collaborated, designed and pitched their problem-solving prototypes to a panel of judges from the region’s top technology firms. Laplante, who’s pursuing Laurier’s social entrepreneurship option, applied to the hackathon to work with other students “in her own backyard” who are passionate about trying to solve global problems. A mutual passion for social innovation connected Laplante with Ahmed and UWaterloo students at the event. Each student registered in one of the event’s three skill streams: user experience and graphic design; hardware and software development; and business fundamentals. They then sourced teammates with shared interests and complementary skills through the event’s online teambuilding channel. Real-world experience with her own startup venture prompted Laplante to register in the business fundamentals stream. In May 2017, she incorporated her venture that uses industrial hemp biomass to create bio-based products such as biofuel, pharmaceutical products and hempcrete, a lightweight concrete-like material. The venture also creates employment opportunities for Indigenous communities. Ahmed is a second-year computer science student at Laurier who registered in the event’s development stream. Fluent in computing languages Java and Python, Ahmed’s skillset contributed to the backend development and coding of the team’s prototype. He’s also familiar with digital electronics, which proved beneficial when sourcing reliable solutions online for hardware-related issues. 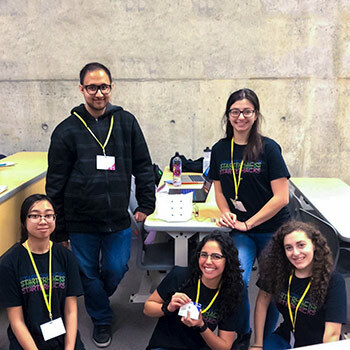 “Working within the hackathon’s tight timeframes taught me how to narrow down an idea so that turning it into reality is more manageable,” says Ahmed. Laplante, Ahmed and their UWaterloo teammates plan to continue work on their prototype with the help of their DragonBoard 410c. While the board is a cool and helpful prize, Laplante says collaborating with students from across the academic spectrum is equally valuable.